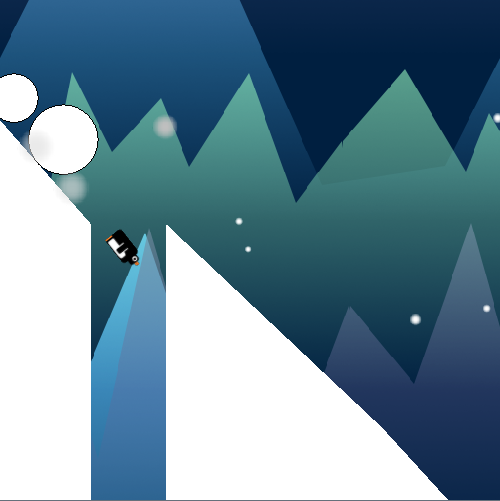 For a combination of One Game a Month, mini-LD 39, and Static Void Games January SNOW theme, I created this little game. It's a bit of a mix of Dino Run and Line Rider. You play a penguin trying to escape an avalanche. Avoid snow boulders, crags, and crevasses for as long as possible! This is my first "real" libGDX game, and I'm pretty happy with it. Nice game! It was odd, I died at the same spot 3 times. What did you do to create your levels? Why didn't you try something random? Thanks for playing! The weird thing is that it *is* randomly generated! Yeah, it probably is randomly generated, he just uses a seeded Random thing probably. Technically the penguin responds faster to user input in the air (no friction), but it's probably hard to tell. I'll have to keep that in mind for my next game. Thanks for the input! Nope, all I'm using is good ol' Math.random() and some parameters (the ground changes by X between 25% and 50% of a screen, then by Y between a 50% drop and a 10% rise). I've made the source available if you don't believe me!